Want2Walk weekly walks will resume on Wednesdays, Wednesday 3rd Sept walk is the Tourlestrane\Curraboy Footbridge walk meeting at Tourlestrane Church carpark at 10.20am. See below details of September walks. Newcomers welcome to join at any time. Tuesday’s the Boccia club meet at 12.30pm in the FRC if you would like to try out the game of boccia why not call into the centre. Thursday Morning Women’s Crafters Group continue to meet weekly in the centre at 10.30am. Conversational English classes will start back on Friday September 5th at 10.00am in the FRC. Classes are open to anyone for whom English is not their first language. Tubbercurry Parent and Toddler group will start back on Monday 22nd Sept at 10.30am. For more information on any of the above contact the FRC 071 9186926. 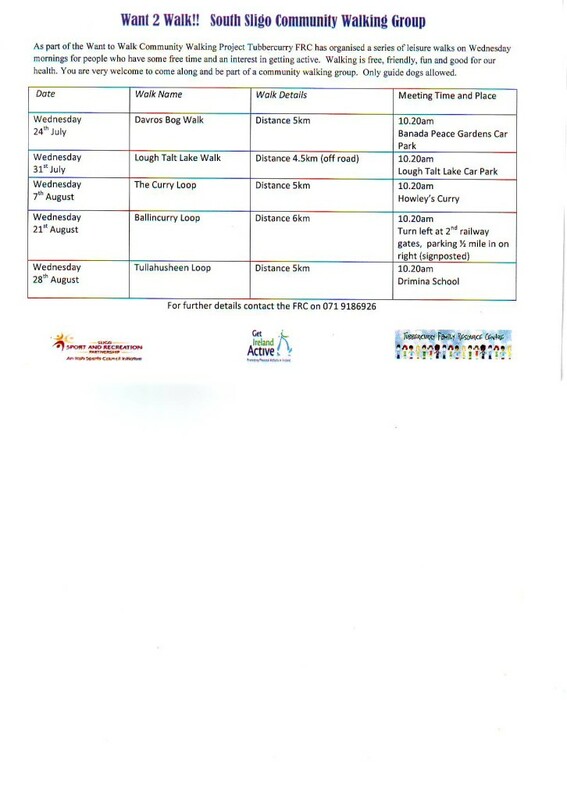 Would you like to join Tubbercurry FRC and participate in a Couch to 5k programme. Commencing on Tuesday 4th Feb at 9.45am a 9 week programme which should have you running\jogging on completion. Training schedule and support provided places are limited so registration required. For more information contact Cathy 071 9186926. This is a fun and interactive 8 week programme for adults which explores and celebrates the potential of those that participate, in a creative, supportive and encouraging space. Sessions will cover areas such as confidence building, engaging with others, self growth, setting goals and stress management exercises. The course is run by a trained and experienced facilitator who will use interesting and fun techniques throughout. All are welcome. Programme is supported by Mayo Sligo, Leitrim ETB, cost of the programme is €25. The first meeting of this group will take place on Tuesday 11th of February @ 10.30am in the community centre. Feel free to come along with your baby and toddler and enjoy a cuppa and a chat and see what the group is about while the children enjoy the toy box. For any inquiries contact Mary on 0719186926. South Sligo Walking group is a free walking group that meet each Wednesday in different locations and walk various trails and loops. For information on walks visit us on facebook or call the centre. All are welcome. A four week course in baby massage course will run in the FRC starting February 4, 11, 18,25th from 11.00am-12.30. This class is suitable for babies 6 weeks to 6 months. This course is beneficial in many ways such as relief of symptoms such as colic, reflux, teething etc as well as providing an opportunity for bonding between mum and baby. Dads also welcome. For more information, contact the centre. The programme will involve participants learning about flower arranging as a creative art. Group participants will be given a demonstration on various types of arrangements (with themes) and they will replicate these using techniques learned. Each participant will be encouraged to use their creative flare to make the arrangement their own. Participants bring there own foliage and materials. Contact the centre for more info. The cost of the course is €30. Tubbercurry Men’s Shed would like to thank all the shed members, volunteers, staff and businesses that helped make the Launch of the Shed @ Banada on December 8th a success. The committee would also like to thank those businesses locally that have made donations to the shed for 2014. The group meet every Wednesday night from 7-10pm in the old national school, Banada Abbey where they have a recreation room and workshops. New members always welcome. Upcoming events along with playing their weekly game they will have a cookery class with Mary, Christmas Bingo and have their annual Christmas dinner. The group are looking forward to 2014 and would welcome new members to the club. The Men’s Shed recently attended the Irish Men’s Shed Association National Conference in GMIT Castlebar where all Shed’s nationally displayed their work from the last year, the Tubbercurry Shed displayed some of their projects from 2013 which included stained glass work, willow baskets, bird boxes and carpentery boxes. An enjoyable day was had by all. This group meet every Monday morning in the FRC at 10.30am, every week there is a different activity. Upcoming activities will include hand print decoration, Christmas Cards, playdough craft, singalong and Christmas party. New parents always welcome. This group commenced meeting for a Wednesday morning walks in June of this year and still continue to meet every week, too date they have visited a number of locations for their walks. If you would like to meet others for a walk\talk the group welcome new people to join at anytime. For current list of walks see schedule below. Fun way to keep active Chair Exercise to Music thursdays at 12.30pm in TubbercurryFRC. For more info contact Diane 087 7630130. Rainbows is commencing a free 12 week programme in Tubbercurry FRC from Wednesday October 16th for children aged 6 to 12 years 7.30pm – 8.30pm. Rainbows is a programme for children and young adults who are grieving a death, separation or other painful transition in their life. For more details on the rainbow programme contact Conor Fitzgerald Project Coordinator 0719186926. Counselling service are you worried about something would you like to talk to someone in confidence.? the service is provided by qualified and certified counsellors and is offered on a sliding scale fee. For more information on this service contact the Project Coordinator on 071 9186926. Parent Toddler\Baby group meet on a monday monring at 10.30am, some of the fun activities fot the children include story time, arts and crafts, baking etc. while parents can enjoy a cup of tea and a chat. Thursday Morning Womens Group meet every thursday at 10.30am new memb are always welcome. Boccia meet and play on a tuesday at 1pm, if you would like to try out the game drop in any tuesday at 1pm. 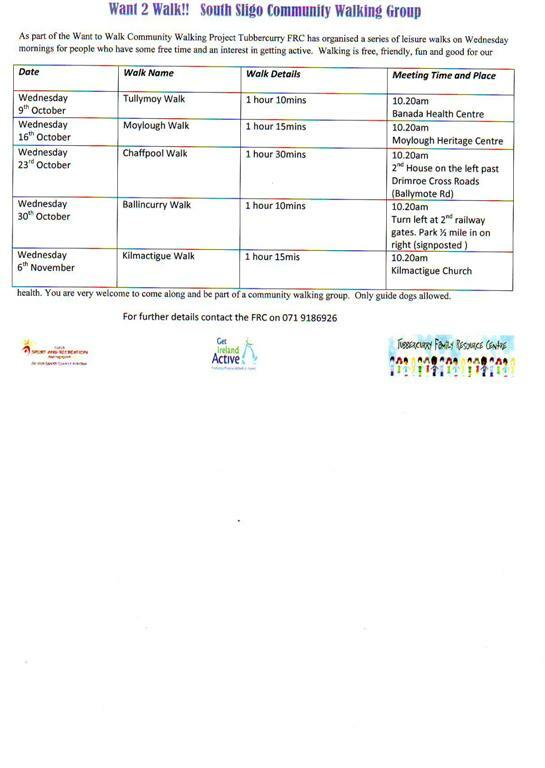 Please see below the schedule of walks for the next 5 weeks, all are welcome to join in at anytime. This week’s walk Wed 25th September is the Lough Talt church walk meeting at Lough Talt church at 10.20am. All are welcome. Autumn computer classes will be commencing in the coming weeks, we are now taking names for the following courses beginner’s, improvers and internet\email. If interested contact the FRC 071 9186926. Tubbercurry FRC in partnership with the Disability Equality Specialist Support Agency (DESSA) will run a four week programme for children aged 6-12 years who have a sibling with a disability. This is a peer support project which is arts based, fun and high energy. It will provide an opportunity for children who have a brother or sister with a disability an opportunity to discuss this with children in he same situation and learn how to communicate there feelings about there sibling effectively. The programme will run on Tuesdays for four weeks, starting October 1st from 4.30-6pm. For further information contact the centre. Volunteer Assistants are required for the programme to assist group facilitators. An information session will take place on 9th from 11am to 1pm for those interested followed by a training and development session on Monday 23rd September. If interested contact Mary on 0719186926. Tubbercurry Parent and Toddler Group Resumes on Monday 9th September at 10.30am in the FRC, the group is open to all parents and grandparents in the area who have children and babies to care for. Activities include music, story time, arts and crafts, etc it gives parents a chance to meet and make friends and enjoy a cup of tea. All are welcome. The FRC has set up a new programme called Rainbows which will commence in the Centre Late September. It is a support group for children and young people who are grieving a death, separation or other painful loss in the family, helping them to manage, express understand and share their feelings of grief in a safe setting with trained listeners. Rainbows is for children of Primary school age. It’s confidential, free, one night per week for about one hour and lasts 12 – 14 weeks. If you would like your child to participate please contact Conor in the Centre on 071 9186926. Places are limited so booking is essential. Women’s Group The Thursday Ladies Group resumes in the FRC On Thursday 12th September, all are welcome. Tubbercurry FRC Childcare & Afterschool are now enrolling for our CCS, CETS & afterschool programs. We cater for children aged 6mths to 12 years of age. All our staff are fully trained and Garda Vetted. As a community childcare provider, reductions can be offered to parents in receipt of a social welfare payment and who hold a medical/GP visit card. Contact 0719186926 for further information. Computers Autumn computer classes will be commencing in the coming weeks, we are now taking names for the following courses beginner’s, improvers and internet\email. If interested contact the FRC 071 9186926. MABS Sligo MABS money advise and budgeting service hold an outreach clinic in Tubbercurry FRC on the third Thursday of every month. Service is available by appointment only, phone 0761072730 to make an appointment. This is a free and confidential service. Leisurely walks continue on a wednesday morning at 10.30am. For details on weekly walks contact the FRC. Group music lessons for national school children in guitar voilin and keyboard will commence in the FRC in September. Tuesday september 10th and 17th a craft workshop in jewellery making and felting of a broach, participants bring home what they make. Cost of workshop is €8. Computer classes beginners, improvers, Internet and email, digital photography etc will be on offer this autumn. For more details on any of the above contact the centre. As part of the Want to Walk Community Walking Programme Tubbercurry FRC is organising a series of leisure walks on Wednesday mornings for people who have some free time and an interest in getting active. Walking is free, friendly, fun and good for our health. You are very welcome to come along and be part of a community walking group. Only guide dogs allowed.